The passion for the vine and the wine is passed down through generations in the Campana family, modern equipment of today allow to better control what nature changes in the various passages from the grape to the wine, the wine to the bottle . Cantine Campana are located at the foot of the hills in the position of favor , at the mouth of the Val d’Arda and Chero ; from the slopes of these valleys originate most of the grapes and the wines produced. The sincerity of our wines and the correct application of wine-making practices and controls throughout the manufacturing process, is the guarantee of satisfaction of our customers that rewards our work for continuous improvement . Cantine Campana is committed every day to raise awareness of its products and the quality worldwide. Winegrowers for love and passion, tenacious quality researchers. 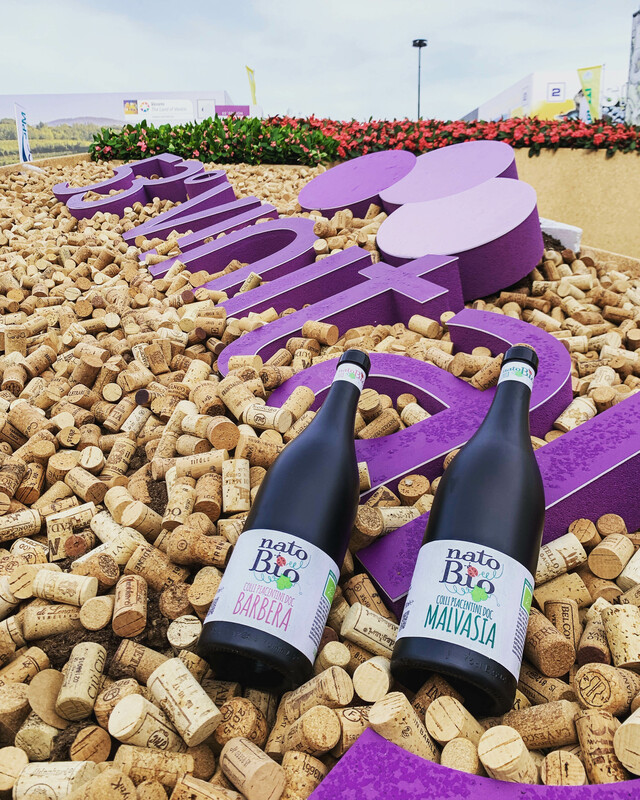 CANTINE CAMPANA is a young and dynamic company located in Val d’Arda and Chero in the “Colli Piacentini”, is presented on the Italian market in wine with fruit power and elegance of wines. 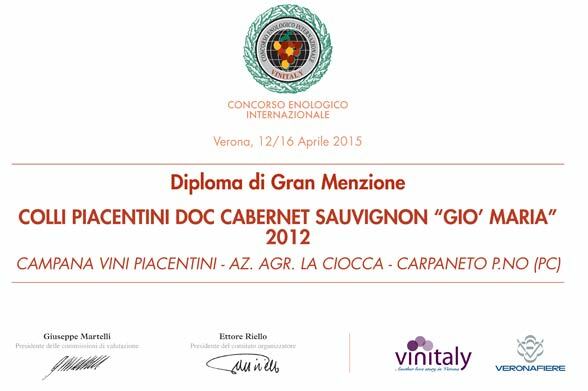 Cantine Campana, has participated in Vinitaly 2015 competition, and on the occasion of this important event in the world of international leading wine has received the diploma of Great mention “Colli Piacentini Doc for Cabernet Sauvignon Gio’ Maria” year 2012.We are honored to have received this important recognition for a wine like Gio’Maria that represents all the quality and tradition of the Colli Piacentini.This wine is part of the “nobili” line. EMILIA ROMAGNA DA BERE E DA MANGIARE 2015: Guida dell’Associazione Italiana Sommeliers (AIS), sezione Emilia-Romagna. 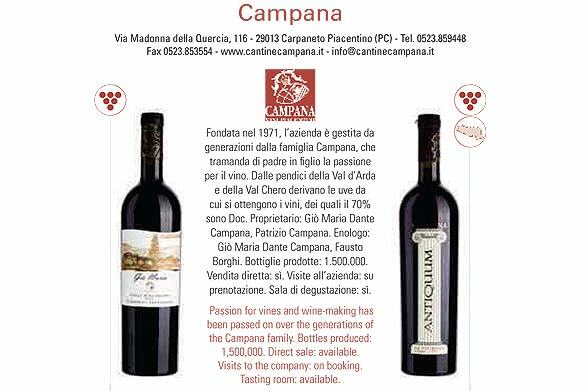 Are two wines from Campana Nobles line Campana present in Emilia Romagna Guide to Drinking and Eating edition 2015: Cabernet Sauvignon Gio Maria and Antiquum. Elegant wines that respect tradition. These two wines are the expression of our commitment and our passion in producing quality wines.